Yesterday, I gave away everything related to dessert that I had on hand. So, Quinn was quick to point out that I needed to bake something today. I looked through recipe after recipe and could find no inspiration. Finally, the hour was getting late and I decided that whatever I made had better be quick. 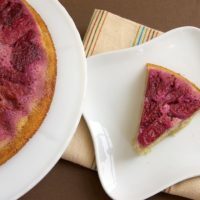 That led me to this cake, which uses one of the best baking shortcuts around (cake mix) doctored up and swirled with cream cheese. 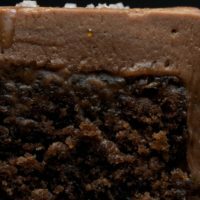 First, mix up a package of devil’s food cake mix as directed on the package. Add 1 teaspoon of vanilla extract. 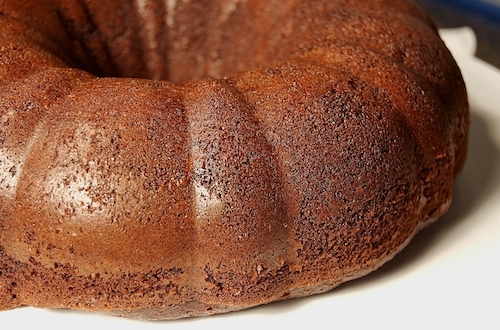 Pour the batter into a greased/sprayed 12-cup Bundt pan. In another bowl, beat together 8 ounces of cream cheese and 1/3 cup of sugar. When this is nice and fluffy, add a large egg and beat well. Stir in 1 cup of semi-sweet chocolate chips. Spoon this mixture into the center of the chocolate cake batter. Swirl with a knife. Bake cake at 350 degrees for 40 to 45 minutes. Cool in the pan for 10 to 15 minutes, then remove from pan to finish cooling. This is exceptionally good, especially considering how easy it was. It was mixed and in the oven in about 10 minutes. The cream cheese and dark chocolate go together very well. Of course, I have made it no secret that chocolate and cream cheese are two of my favorite things. 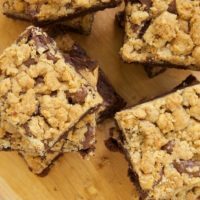 The chocolate chips don’t melt completely, so they add a bit of gooeyness. I highly recommend that you serve this warm. Quinn recommends ice cream, too. Mix cake mix according to package directions. Add vanilla extract. Pour into greased/sprayed 12-cup Bundt pan. Beat together cream cheese and sugar until fluffy. Add egg and mix well. Stir in chocolate chips. Spoon this mixture into the center of the cake batter. Keep this mixture away from the sides of the pan. Swirl with a knife. Bake for 40 to 45 minutes. Cool in pan for 10 to 15 minutes. Then, remove the cake from the pan to cool completely. Recipe adapted from Southern Living’s Easy Weeknight Favorites. Oh my, it looks oh so good.. Thank you so much for using a cake mix! I always feel lazy in the food-blog world when I use ANYthing store-bought. Looks fantastic. Abby, I have very few qualms about cake mixes as a starting point. I used to be opposed to them entirely, but then I found out that my incredible wedding caterer uses them as the foundation for some of her amazing wedding cakes, and I changed my tune. Not that it’s a bad thing, but doesn’t Quinn like icecream on everything? Except biscuits. This looks interesting and easy too. I’ll give this a try. I use cake mixes as foundations for quite a few cakes also! My grandmother gave me one of the “Cake Mix Doctor” books a long time ago and we have really liked most of the recipes we’ve tried from there. 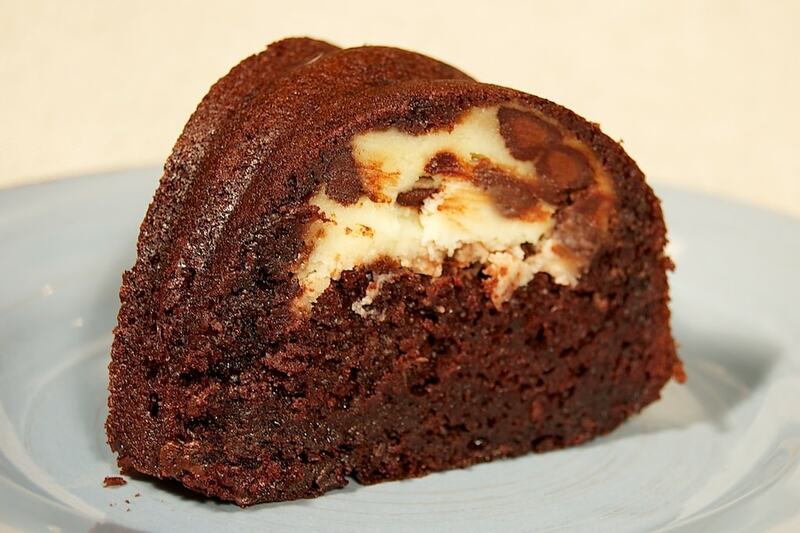 This bundt cake looks so good! Leslie, we’re both glad that you two are enjoying this yummy cake! 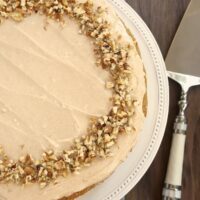 Has anyone tried this as a sheet cake? Karen, I haven’t tried it that way. I don’t see why it wouldn’t work, though. It might be a little harder to swirl since it won’t be as thick.